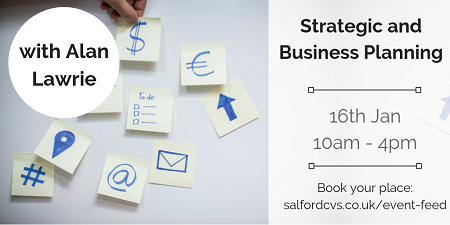 A one day course to enable voluntary organisations to plan ahead, agree a strategy and draw up a useful business plan to make the case for funding your organisation. This course is designed to help managers and trustees think and act strategically and to ensure that their organisation has a credible and realistic plan that will win support. The course will also look at ways in which organisation can take a more strategic approach to funding, broaden out their income base and consider new approaches such as social enterprise. The course is packed full of real life examples, case studies and tools and technique to use in your organisation. The course is practical, relevant to local organisations and based on real life examples. Understand the relevance of strategy to a voluntary organisation. Be able to develop a credible income plan for their organisation. Appreciate the key issues involved in bringing about strategic change. Alan Lawrie – an independent consultant and author who specialises in strategy and organisational development for voluntary organisations. He is the author of five books on different aspects of managing voluntary organisations including the best selling, The Complete Guide to Strategic and Business Planning.